◼ “HERE’S A NEW BLUE RONDO REMIX — at last we’ve got it right. Recorded in 1981 … remixed in 2012.” So says the Latin-funk combo’s founder and frontman Chris Sullivan on Facebook today, after posting on Soundcloud a pacy instrumental mix of the London clubland band’s first hit, Me & Mr Sanchez, which stayed four weeks in the UK chart in 1981. Wait for the virtuosi to open up in the second half. In the topmost pic we see vocalist Sullivan onstage demonstrating his northern soul choreography alongside sidekick Christos Tolera. 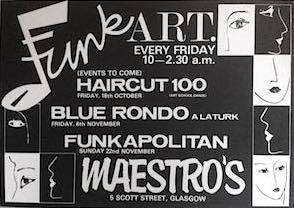 This pic was taken during Blue Rondo’s promotional tour for their debut single at Glasgow’s trendiest nightspot Maestro’s on 6 Nov 1981, the day of its release. 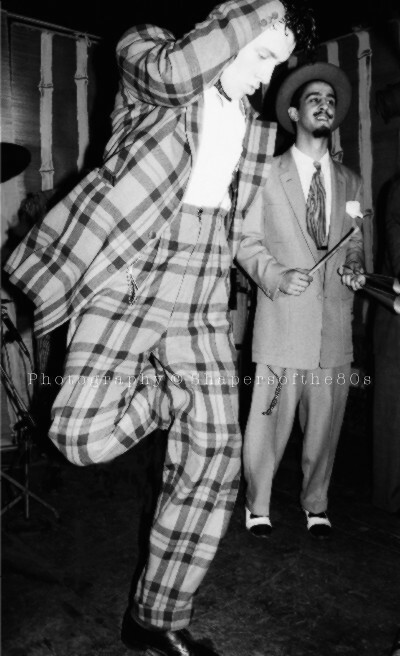 As a former fashion student at St Martin’s School of Art, Sullivan almost single-handedly introduced the zoot suit to Soho’s nightclub scene, and designed styles for both himself as leader of the band and for Tolera and Beat Route host Ollie O’Donnell, among many others. This entry was posted in Clubbing, dance music, Fashion, Pop music, Swinging 80s, Youth culture and tagged Blue Rondo a la Turk, Chris Sullivan, Christos Tolera, clubbing, Glasgow, Klactoveesedstein, Maestro’s, Mark Reilly, New Romantics. Bookmark the permalink.